The singer says the tumor removed from her mother is benign. It's Showtime host Karylle just announced on the noontime program that Zsa Zsa Padilla's operation in the USA was a success. The singer-host flew to the United States last week to be with her mother who was diagnosed with stage I kidney cancer. The singer says the tumor removed from her mother's kidney was the size of a golf ball but was diagnosed as benign. 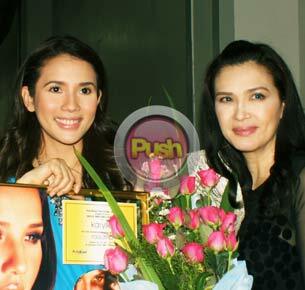 Karylle thanked everyone who said prayers for her mom's successful operation. She also said special thanks to Queen of All Media Kris Aquino, a close friend of Zsa Zsa's, who gave her her airline ticket to follow her mom abroad.